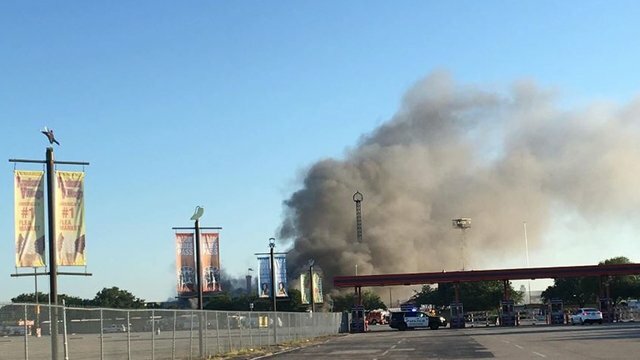 GRAND PRAIRIE—A two-alarm fire destroyed a single structure at the Grand Prairie Trader’s Village on Friday morning around 7:30 am. At this point there is no clear cause for the fire but officials are calling the building a total loss, according to a Grand Prairie Fire Department spokesmen. The market is only open on the weekends, so no one was inside at the time and no one was hurt. Traders Village Spokesman Jerry Holt confirmed that the market will still be open this weekend and in fact there is a concert series scheduled and vendors will conduct business as usual. There were no injuries reported, since the flea market is only open on the weekends.